Current weather observations live from the roof of the Cambridge University Computer Laboratory in Madingley Road, Cambridge. Many thanks to the Computer Laboratory Digital Technology Group for supplying us with this data. 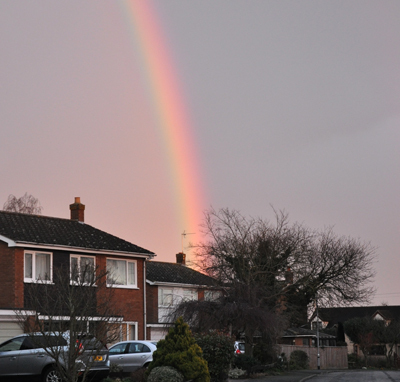 2014 - one of the wettest winters ever recorded - the picture below shows a rainbow from Pettitts Close on Thursday 20th Feb.
Friday 8th August 2014 - Dry Drayton was caught in an exceptional storm with over 4 inches of rain falling between 3pm and 5pm. There were flash floods in the area, particularly the underpass on the A428 near the Scotland Farm end of Scotland Road. 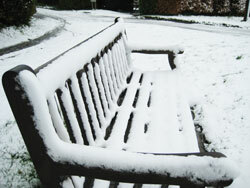 Rainfall per hour went off the scale at the observatory on the University's West site. 2009 - Thursday 18 December - 2 inches of snow overnight left much of the village like a skating rink for some days. 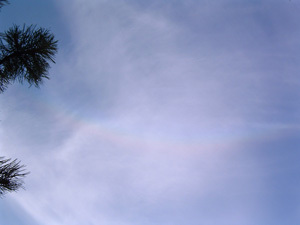 2009 - local resident Mike Clydesdale reported an unusual weather phenomenon on 24th September 2009 observed from Pettitts Close at around 4.00pm. 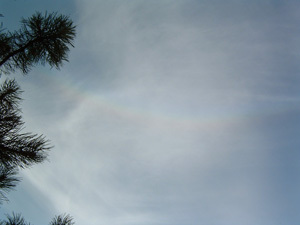 "It was like an upside down rainbow and had an attendant "sun dog" (another slight rainbow effect) to its side. 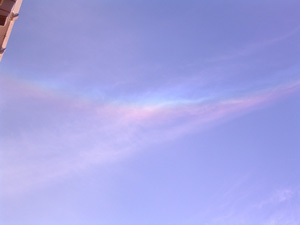 These are rare phenomena caused by the refraction of sun rays through ice crystals in the Cirrus cloud" said Mike. 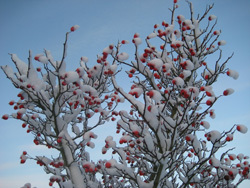 Mike has kindly allowed us to publish his pictures below, although he states they do not do justice to the phenomenon.